Autism spectrum disorders (ASDs) are pervasive developmental disorders (PDDs) characterized and diagnosed by social interaction and communication impairment and restricted, stereotyped, and repetitive patterns of behavior and language. These disorders affect hundreds of thousands of children (an estimated 1 in 110 children) with an increasing incidence. The etiology of ASDs is complex, and a cure remains elusive. Among the various treatment modalities being evaluated for these individuals, studies on the gluten-free and/or casein-free (GFCF) dietary intervention. .(Gastrointestinal flora and gastrointestinal status in children with autism--comparisons to typical children and correlation with autism severity.2011) suggest that some children with ASDs may positively respond to implementation of the diet. Specifically children with autism had higher proinflammatory cytokines following challenge with food proteins from gluten, casein, and soy, compared with normal controls and non-autistic children with known symptomatic food allergies. In addition to resolved GI symptoms, parents often report improvements in speech and communication skills, decreases in hyperactive behavior, improvements in their child’s ability to focus, and decreases in sleep problems following implementation of the diet (Effectiveness of the gluten-free, casein-free diet for children diagnosed with autism spectrum disorder: Based on parental report.2012). Dipeptidyl peptidase-4 also known as adenosine deaminase complexing protein 2 or CD26 (cluster of differentiation 26) is a protein that, in humans, is encoded by the DPP4 gene. The gene for this enzyme is distal to other suspected autism genes on 2 and Q of 7 and is expressed in the kidney, the small intestine, the liver, the blood-brain barrier, and has involvement in T-Cell activation. The protein encoded by the DPP4 gene is an antigenic enzyme expressed on the surface of most cell types and is associated with immune regulation, signal transduction and apoptosis. It is an intrinsic membrane glycoprotein and a serine exopeptidase that cleaves X-proline dipeptides from the N-terminus of polypeptides. 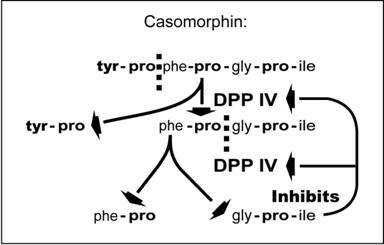 DDP-IV enzymes are responsible for the decomposition of casomorphin, which is released from casein, and gluteomorphin issued by gluten. Casein and gluten also release desmorfina and other peptides opiodi whose presence is characteristic of autism. Autistic children shows a high prevalence of dpp IV enzyme damage. An alteration of enzyme activity mediated by mercury (the debate about the implications of vaccination in autism etiology could be very interesting). A dysfunction derived from an altered gut flora (many children with autism have an altered gut flora). Use of drugs like inhibitors of dipeptidyl peptidase 4 used to treat diabetes mellitus type 2. Peptides from gluten and casein are important because they react with opiate receptors in the brain, thus mimicking the effects of opiate drugs like heroin and morphine. The peptide from wheat is called gluteomorphin (gluten + morphine) and the peptide from milk is called caseomorphin (casein + morphine). Gluteomorphin (also termed gliadorphin) has been verified by mass spectrometry techniques to be present in urine samples of children with autism by Alan Friedman, Ph.D. in work done at Johnson and Johnson. Both casomorphin and gluteomorphin are composed of seven amino acids. Both casomorphin and gluteomorphin start with the beginning N-terminal sequence tyr-pro (for tyrosine and proline) with additional pro residues (proline) in positions 4 and 6 of both peptides as indicated below (Abnormalities of the Digestive System:Gluten and Casein, Peptides, Secretin, CCK, and Pancreatic Atrophy.2006). Dipeptidyl peptidase IV has the job of breaking down peptides in which the amino acid proline (abbreviation pro) is in the second position of the peptide as it is in both casomorphin and gliadorphin shown above. 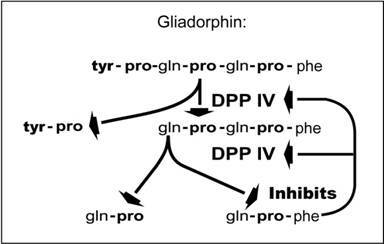 Gliadorphin and casomorphin are important substrates for the enzyme DPP IV. Each molecule of casomorphin and gliadorphin is processed twice by DPP IV. After two dipeptides are removed from gliadorphin and casomorphin, tripeptides with proline in the middle position remain. One might expect that DPP IV would then remove another dipeptide from these molecules; however, this is not the case. Instead tripeptides with proline in the center position are potent inhibitors of DPP IV that essentially inactivate DPP IV. By breaking down casomorphin and gliadorphin, DPP IV essentially embarks on a course of self-destruction. As a result, many of the other functions of DPP IV may be impaired. As a matter of fact, the inhibition of DPP IV breakdown of other important regulatory peptides by casomorphin and gliadorphin may be much more important than the opiate effects of these molecules. Casomorphin and gliadomorphin can be react as ligand for opioid receptor in different area of the brain (The concept of entero-colonic encephalopathy, autism and opioid receptor ligands.2003 )and these peptides have been shown to react with areas of the brain such as the temporal lobes (39-41), (which are involved in speech and auditory integration. All opioid receptors belong to the superfamily of receptors coupled to G proteins exclusively type inhibitory (Gi / Go): this inhibition has an effect on adenylate cyclase and hence on the production of cyclic AMP, the most important of second messengers. 3 receptors are known:μ (Mu),k (Kappa) and δ (Delta). Their mechanism is related to the modification of electrophysiology of potassium and calcium and more precisely: μ and δ receptors increase the conductance potassium while receptors k reduce the conductance calcium. δ: does not produce analgesia, but decreases intestinal transit and depresses the immune system. Opioids tend to inhibit neuronal transmission at both pre-and post-synaptic. In fact, the stimulation of presynaptic mu receptors causes inhibition of N-type calcium channels to and therefore a reduction of the production of neurotransmitters while stimulation of postsynaptic receptors mu produces hyperpolarization by activating the potassium channels and those inhibiting the L-type Calcium. The connection between the diet and the autism exposed above has not yet been scientifically demonstrated but it may be significantly an input for further studies . Infact children with autism frequently improve overall after restriction of these foods.A further point of analysis could cover the connection between DPP4 inhibitors and possible effects on the central nervous system as a result of the relationship described above. Currently there are no studies about this.